Awoke to another great day in Roscoe Bay. Got out the kayak and tooled around, checking out the drying shoal and the head of the bay and all the boats along the way. Best of Times in Roscoe Bay. Best of Times as viewed from the Kayak. During our travels we noticed a unique from of art. 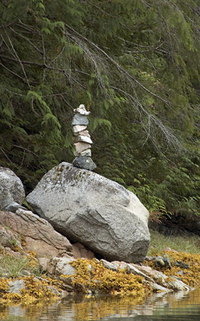 Small rocks piled up on other rocks at or near the shore. We thought they might be there to indicate unmarked hazards. Roscoe has more than its share of "rock art"
Perhaps they simply marked that a person has passed this way. Most are simple structures, comprised of a few rocks balanced to stand the test of time, but without meaning we could decipher. However, one composition did catch our eye. A creative hand, or an enlarged self-image? We decided to head out to Refuge Cove to reprovision a bit before heading over to Melanie Cove in Prideaux Haven for the night. Refuge Cove was hopping. As we left Roscoe Bay, it was rather windy and there were some waves and white caps. When we got to the docks, there wasn’t a lot of room, but Bob decided to wedge the boat into a spot that meant that the prevailing wind was going to try and blow us off the dock, not onto it. Not only did he do a great job of docking, but also, as I tossed the stern line to the nice fellow on the dock, it turned out to be the guy from Coyote Blue, recipient of our salmon the day before! He told us that it was supposed to really blow hard that night and that gale force winds were forecast for both Johnstone Strait and the Strait of Georgia. Hmm. We went to provision, found great stuff, and while our friends on Coyote Blue decided to stay at the dock for the evening, we headed over to Melanie Cove as originally planned. The store at Refuge Cove. Bob said that MC would be sheltered from the winds. To my eye, it looked as if, while sheltered, the winds would still whip down the cove. Wonder who was right? 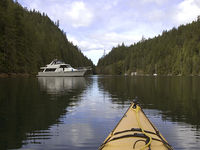 There were lots of boats in Prideaux Haven and Melanie Cove, the two quintessential anchorages in Desolation Sound. Still, there was more than enough room for us and we set the anchor well in case the wind picked up. I wanted to go kayaking, but Bob wanted to chill out first. By the time we climbed into the kayak, it was blowing pretty good. Our “upwind” paddle was painfully hard, and it started to rock and roll a bit as we left Melanie Cove for Prideaux Haven. We cut our kayak short and headed back for the boat. Well, going downwind was really fun. We were smoking along, doing warp speed without moving our paddles at all. In fact, we held the paddles out as if they were mini-sails and grinned all the way back to the boat. Oh yes…it blew hard that night! And rained sometime overnight as well!